The MCG is transforming into one of Australia’s most technically advanced and connected stadiums for fans. A secure, high-density WiFi network has been installed in the stadium, offering fans, members and stakeholders access to the internet on any device at the stadium for free. The "MCG FREE WIFI" network is now available and allow fans to access real-time and interactive content and the ability to engage with others at the game. In addition, Telstra has improved 3G and 4G connectivity within the stadium. Turn on WiFi settings on your device. Select ‘MCG FREE WiFi’ from list of available networks. A registration page will appear. Enter your details, accept terms and conditions and click submit. To do this, turn on WiFi in settings, select the ‘i’ icon on ‘MCG FREE WiFi’ in the list of available networks. Then, disable and enable WiFi and select MCG FREE WiFi again. The registration page should appear automatically. These settings will also ensure you join the WiFi automatically upon your next visit to the MCG. The following are minimum requirements to allow you to register and connect to the MCG WiFi network. Not since the days when teams were still playing at Victoria Park, Windy Hill and Punt Road have clubs been able to create a true home environment at their games. As the ‘G is the home ground to up to 10 different sporting teams in any 12 months, one of the central pillars of the MCG’s technology improvements is the ability to theme the stadium in the colours of the home team. LED lights now encase the entire stadium and illuminate the entrances, enabling the exterior of the stadium to be lit up in club colours. As fans embark on their trip to the MCG, they can see the stadium lit up like a beacon wherever they are travelling from. Digital signage along the concourse compliments the stadium lighting and provides information to fans about the day’s event and how to easily get around the stadium. Once inside, LED signage around the fences help create a real home game atmosphere as clubs have licence to turn the stadium into their own fortress. 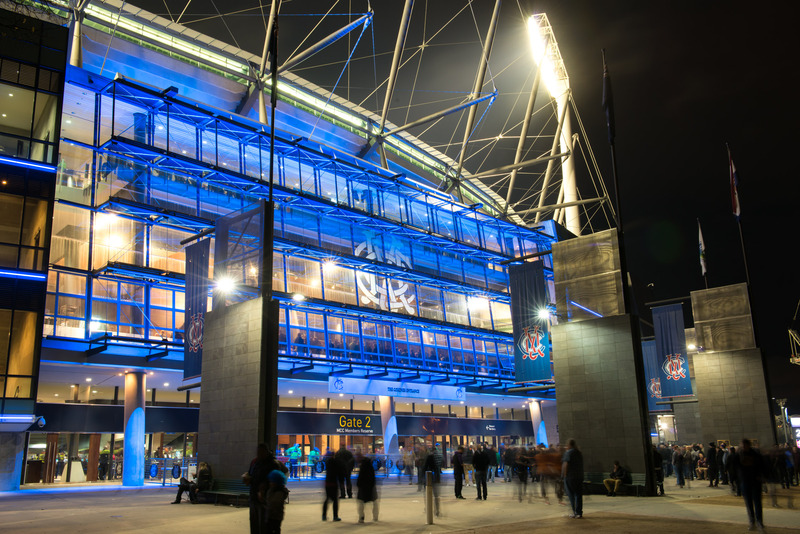 A state-of-the-art exterior LED lighting system will enhance the visual appearance of the Melbourne Cricket Ground and allow teams to personalise and theme the stadium for their fans. Click to watch an example of the concept. Fans can now watch high-definition replays and keep track of the action as it unfolds via almost 3000 TV screens around the stadium - meaning that fans won’t miss a moment wherever they may be. Part of the upgraded network includes a best-of-breed Internet Protocol Television (IPTV) system, to deliver the action as it happens. The IPTV system involved installation of 800 additional high-definition TV screens. The high definition screens will also promote fan competitions, statistics, broadcast other major sporting events in the stadium’s bars and corporate suites, display key information, and much more!